These bags are handy for when you don't want to take everything with you....just your purse, glasses, car keys, etc. 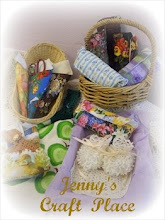 Jenny, all your hand mades look beautifully made, I hope you are very busy replacing stock in the next few weeks from all your sales..!! !